Healthy snacks play a part in our overall enjoyment of food. They are important to have at hand for busy days, especially when we are traveling and do not know when we will be able to purchase a meal. Healthy snacks can also feature at celebrations because they present well, are satisfying and most importantly taste great. Raw unsalted nuts are a healthier alternative to potato crisps and other highly processed crisps or savoury snacks. Salted foods stimulate our appetite, and increase our thirst. Not a good combination if you are having your snacks with alcohol as you will drink more. Nuts offer a range of flavours – walnuts, almonds, peanuts, cashews and macadamia nuts all taste different. Nuts present well in individual bowls or as part of a mixed platter. Tip – check if your guests have nut allergies. Toasted grain bread with sliced tomato, basil and a drizzle of olive oil and balsamic vinegar. It doesn’t get simpler or tastier than this! Tip – check if you need a gluten-free option for your guests. Dips are enjoyable with crackers, bread or vegetables. Vegetables are a great option if you have guests who require gluten-free foods. Ideal vegetables to accompany dips are carrot, celery and firm cucumber sticks and, sliced capsicum and mushroom. Dips can be made ahead of time and stored in your refrigerator. If you are buying pre-made dips, check the ingredients list for added salt and sugar. The variety is endless. A few of my favourites are goat’s feta, camembert, blue vein, and gouda. Cheese can be eaten alone or with crackers or toasted bread. It presents well as part of a cheese, fruit and nut platter. Tip – check if you need a gluten-free crackers and bread for your guests. Use your kebab sticks for cubes of in-season fresh fruits. Colourful, tasty and refreshing. For example, you could place a wedge of pineapple with a strawberry, a thick slice of kiwi fruit, and a cube of watermelon on one stick. This looks great and it is easy to eat. Sorry for being old fashioned, but you can’t beat a freshly made sandwich. There are so many varieties of bread and fillings. A few favourites that taste great and offer sustenance. Tip – you can replace the cheese with meats, poultry, smoked fish or lentil based patties. Rice paper can be purchased from most supermarkets. The rice paper needs to be dipped in water before making the rolls. Follow the instructions on the packet. Making them seems a little fiddly at first, but once you work out how much filling your require they are easy to wrap up (literally). The rolls keep well for few hours. A known favourite of mine is falafel. I haven’t mastered making them myself yet as I am looking for a baked recipe (rather than deep fried). There are a few pre-prepared falafel options at the supermarket but watch the salt content. I usually buy them from a local Turkish or Lebanese café. Rissoles can be served hot with a sauce. Make them bite size so they are easy to eat. Round crackers present well and are easy to eat. You can use any of the dips and fillings mentioned in 3 and 6 above. Tip – read the ingredients list for salt and fats. Plain water crackers and rice crackers are usually a good option but there are also some tasty mixed seed and grain varieties too. Frittata is a gluten-free alternative to quiche. It is easier to make than quiche as it doesn’t require a pastry base. Frittata can be based on vegetables, with, or without, added meat. Most importantly it can be prepared ahead of time. It tastes great warm or chilled. When planning healthy snacks consider whether they are for a special occasion or for day to day eating. 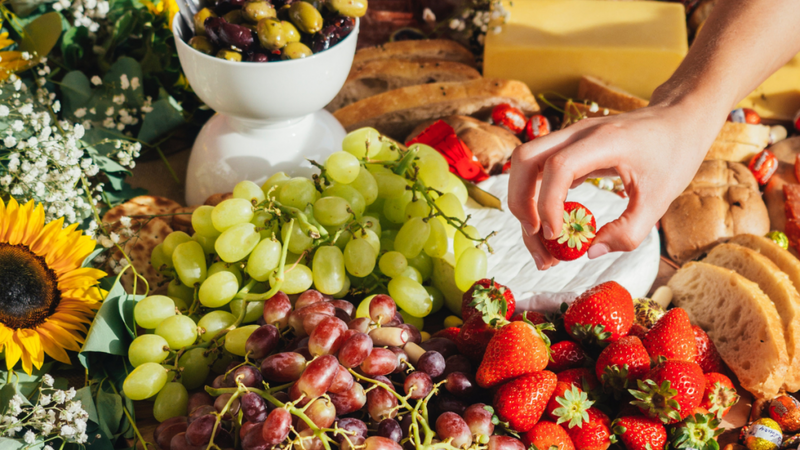 The more often we eat snacks, the more we need to consider how they fit in with our overall nutritional balance and our meals. For more tips on planning meals and snacks, read the Eating for You book.